A team of astronomers is the first to directly measure the spin of a distant supermassive black hole that is about 6 billion light years from Earth and 7.7 billion years old. Published in the journal Nature, the findings offer insights into how black holes and their host galaxies grow and change over time, researchers say. Supermassive black holes are believed to lurk at the cores of most, if not all, galaxies. Millions or billions of times more massive than our sun, they play an important role in how galaxies evolve. “The growth history of a supermassive black hole is encoded in its spin, so studies of spin versus time can allow us to study the co-evolution of black holes and their host galaxies,” says co-author Mark Reynolds, assistant research scientist in astronomy at the University of Michigan. Spin refers both to the speed and direction of a black hole’s rotation in relation to the gases falling into it. While astronomers have long been able to measure black hole masses, determining their spins has been much more difficult (spin and mass are the two characteristics used to define black holes). Over the past decade, scientists have found ways to estimate spin from several billion light years away, but their methods were indirect and relied on assumptions. “We want to be able to cut out the middle man, so to speak, in determining the spins of black holes across the universe,” says Rubens Reis, a postdoctoral research fellow in astronomy and first author of the new paper. 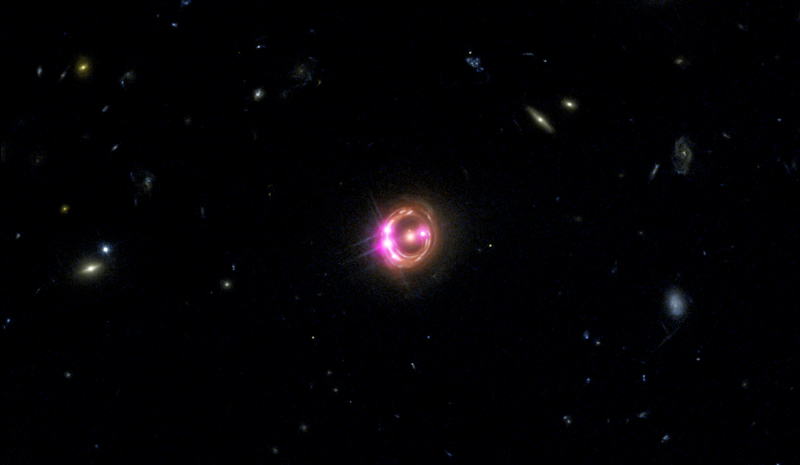 They were able to do that for the black hole at the center of the quasar known as RX J1131-1231 (RX J1131 for short). Quasars, among the most luminous and energetic objects in the universe, are made of matter falling into supermassive black holes. They give off energy and light at various wavelengths including visible and X-ray. Under normal circumstances, this faraway quasar would be too faint to study. But the researchers were able to take advantage of a sort of natural telescope effect known as gravitational lensing and a lucky alignment of the quasar and a giant elliptical galaxy to get a closer view. Gravitational lensing, first predicted by Albert Einstein, occurs when the gravity of massive objects acts as a lens to bend, distort, and magnify the light from more distant objects as it passes. The researchers amplified their natural telescope signal with NASA’s Chandra X-ray Observatory and the European Space Agency’s XMM-Newton telescope to determine that the black hole is spinning at nearly half the speed of light. The X-ray data let the scientist measure the radius of the disk of the matter falling into the black hole, and from its radius, they could determine its spin speed. Measuring the spin of distant black holes can help researchers figure out whether they grow through large mergers or smaller episodes. If they grow mainly from galaxy mergers, they should feed on a steady supply of new material from one direction in their surrounding disks, according to NASA. That would lead to rapid spinning. If they grow through many small episodes, such as interstellar gas clouds and stars wandering too closely and falling in, they would be expected to accumulate material from random directions. Like a merry-go-round that’s pushed both backwards and forwards, this would make the black hole spin more slowly, the researchers say. The discovery that the black hole in RX J1131 is spinning at nearly half the speed of light suggests that it has grown via large mergers. “The ability to measure black hole spin over a large range of cosmic time should make it possible to directly study whether or not the black hole evolves in step with its host galaxy,” Reis says.